slow but constant, long sway, with constant trajectory. a lovely 4.4 “welcome home” in west texas. this sleep shaker originated only 6.4 miles down where in comparison the valparaiso rockers from the summer averaged a range from 10 – 30 miles below. in comparison texas carried this energy low and shallow to the punched forced thrusts of valparaiso’s rocks. typically texas doesn’t earth-dance, located on the North American tectonic plate far from the active seams this state is one of the more dormant in terms of fault activity. 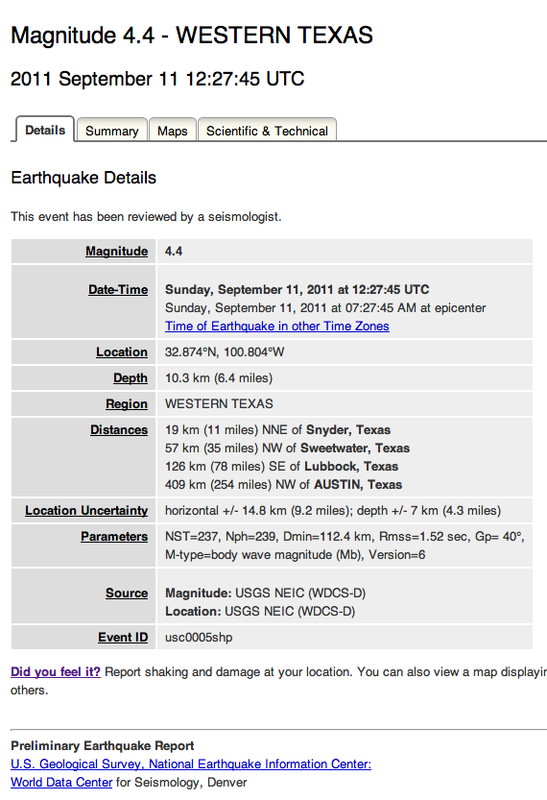 the largest recorded earthquake since 1699 registered as a 5.8 on August 16, 1931 near Valentine, TX. This entry was posted in earthquakes, lubbock by vmcreynolds. Bookmark the permalink.